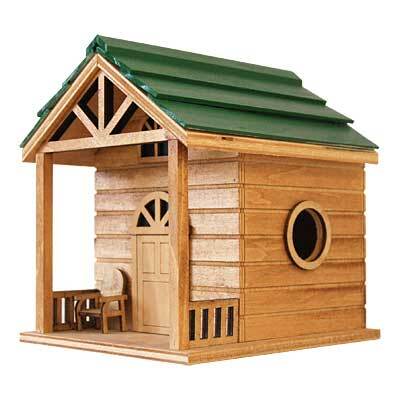 Create a vacation spot for birds in your backyard with this Home Bazaar Living the Life Cabin Bird House. Brown and green tones throughout this item enhance the hues in your garden, while the wooden body offers a rustic hint. Routed lines along the body of the home evoke a log cabin, and a miniature chair, window box with fabric flowers, and porch rail complete the effect. A 1.25" diameter opening sits on the side of the home, creating a cozy nesting spot for small birds. A drainage hole centered on the base aids in keeping the nest dry, and ventilation gaps beneath the roof overhang help regulate the internal temperature. The striking green, lapped roof adds bright style to the unit while protecting the interior from rain, and a back panel removes for seasonal cleaning and maintenance. Metal, keyhole shaped hardware on the back of the piece makes it simple to place against a wall or other flat, vertical surface, and the level base is great for placement on a pole or post. The brown body is sure to bring a rustic look your yard, furthered by the wood construction. Invite birds to retreat in your backyard by placing this Living the Life Cabin Bird House in it.